Looking for some outfit inspiration? 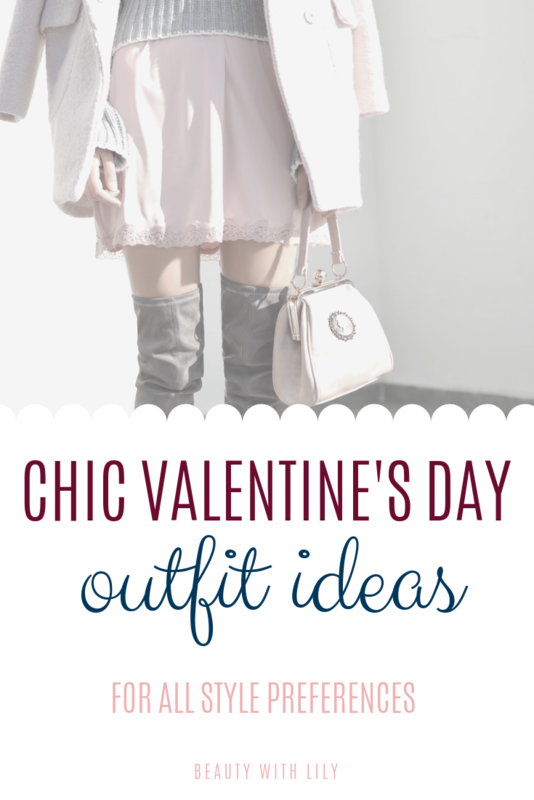 These chic Valentine’s Day outfit ideas are perfect for February and any other day of the year too! Hi friends, happy Wednesday! Today’s post is all about girly and cute fashion! Get ready for pink overload — hey, I warned you. Be sure to let me know in the comments which outfit was your favorite! You may think it’s too early to start thinking about Valentine’s Day, but we are less than a month away — it will be here before we know it. It’s better to plan ahead and be ready, am I right? Below you’ll find a few chic Valentine’s Day outfit ideas, for almost all style preferences. I hope you find one that you love, love, love as much as I do! This sweater has an adorable heart on each elbow — subtle but still festive and girly. I love the color combo of red and blush together, it’s so feminine and sweet. At first glance this looks like a regular pom pom cardigan, but the poms form little hearts. How cute, right!? I chose the wine colored cardigan for this outfit idea, but it also comes in several other shades. This cozy outfit is perfect for running errands, shopping or a brunch date with your girlfriends. There’s no need to sacrifice looking cute and being comfortable at the same time. For all of my glamorous gals, this outfit is for you! This midi skirt with pearl embellishments is stunning! Did you get sick of all of the pink and red? I hope not, they are some of my favorite colors, so any chance I get to pair them, I take full advantage! Let me know down below which one of these outfits was your favorite! Are you into fun, cute Valentine’s Day pieces? "7 Key Pieces To Survive Winter"